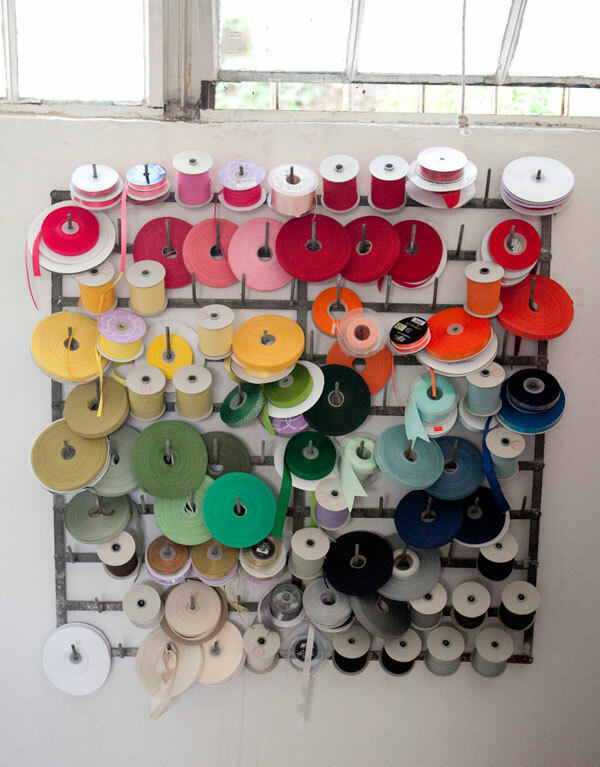 For as long as I can remember, I’ve wanted a rainbow ribbon wall at my studio. I’ve collected tons of ribbon over the years, but up until now it’s just been sitting in boxes in my party closet. When we moved into the new studio last year, I purchased an awesome bottle drying rack at the Alameda Flea Market so that we could start displaying all our ribbon. We hung it up and threw on the ribbon we had, but it was still missing something. I knew we needed some special ribbon to fill in the holes. So, I was super excited when I met Angela Liguori the last time I was in New York. She sells the most beautiful Italian ribbon I’ve ever seen. When my Studio Carta order arrived in the studio, I literally gasped as I opened the box. The colors are so beautiful and the ribbon is perfect and soft. It was exactly what our wall needed. It’s funny because I realized I haven’t bought much purple ribbon over the years. When I put up the ribbon wall I only had one roll! The final result is a dream come true! I cannot wait to experiment with all this ribbon. This post is sponsored by Studio Carta. This is absolutely adorable. Glad you finally get to display your ribbons! Ooh I absolutely adore this!! So much colour! When I get a proper home office, I’d love something like this. This looks fabulous! 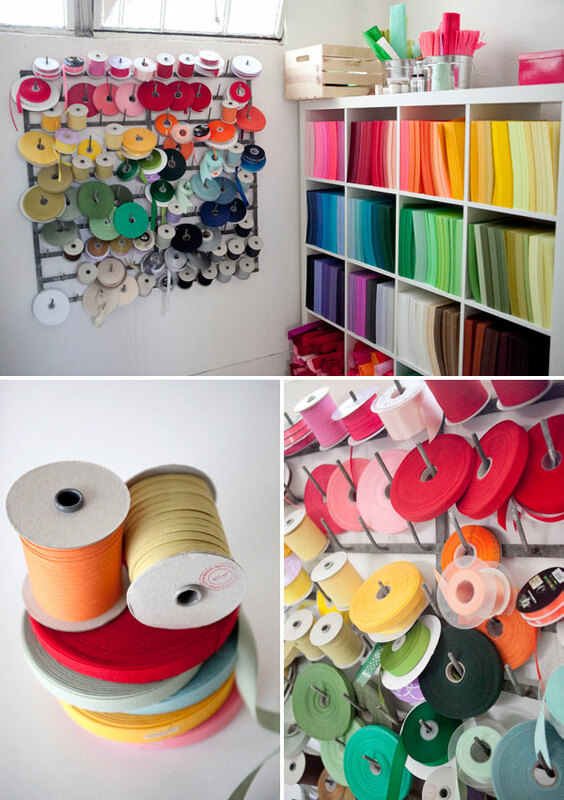 I am waiting for the day when I can have a fabulous craft room in my house! This is awesome! I’m so jelous (did I misspell that? I’m not a native speaker)! I love your display, but your paper stash is where my primary envy lies! Weeeeee! The organization brings me so much joy! YOU’RE swooning….I’m without breath, without words! 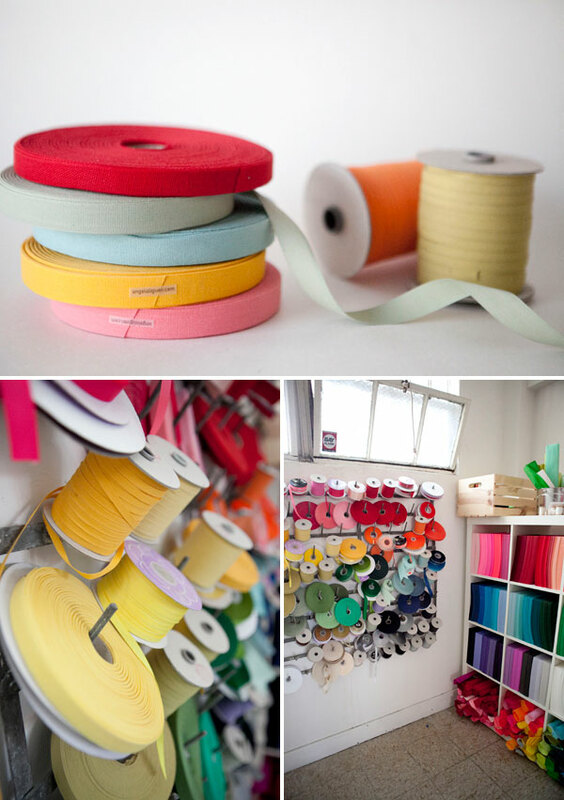 The ribbon wall is divine, but that paper….oh. my. goodness. I am dying over here….I could move in today. Divine. oh lord i am just dying with jealousy! This is like my dream! So pretty! So cool that wall!! love the combination of colors!! If you are ever in Hong Kong, check out the ribbon shops in Sham Shui Po – absolutely amazing! That’s quite a ribbon display you have up there. Waiting to see what fun projects you come up with! Wow – that looks sooo beautiful! I really like the different colors! Wow – that looks so beautiful! I really like the different colors! I use Angela Liguori’s ribbon as trim for some of my pillows for sale on http://www.verdecosi.com. It’s great to sew with! Enjoy! Ok, this is exactly why I read this blog. It makes no sense, really. I am not crafty! I don’t even try. I’m a lawyer. But…part of me really just wants to nerd out over a ribbon wall. It makes me happy, for whatever reason. Thank you for letting me live vicariously through your blog!